It might seem strange that Francois Hollande headed straight from negotiating the Ukraine Crisis to ‘open’ a very short stretch of autoroute in central France at the weekend, but he had important business to discuss with the motorway operators. Also, Paris officially unveils measures to tackle the next pollution crisis. The Netherland starts the first autonomous truck trials. The EU invests in an interoperable fast charging network for electric cars. Portugal is the latest country to see fuel price hikes. The Georgian Military Road shuts again but the A-67 to Santander is definitely open. President Hollande flies in from Moscow to open the final stretch of Lyon to Bordeaux motorway. After discussions with Vladimir Putin about the Ukraine Crisis in Moscow on Friday, German chancellor Angela Merkel flew straight to the Munich Security Conference. Meanwhile, her partner in the negotiations – French president Francois Hollande – headed for Correze in south central France to open a motorway. There was however slightly more to the event than just cutting the ribbon on the missing 4.5km link in the A89. 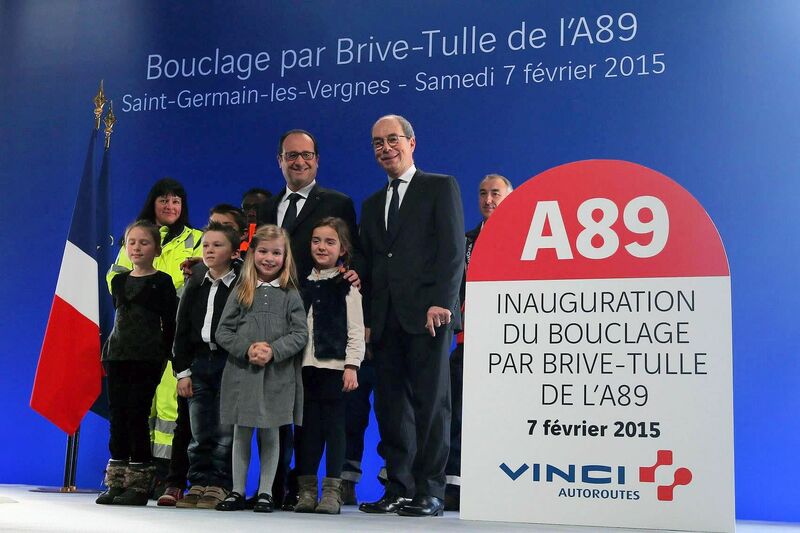 Also attending was Pierre Coppey, deputy CEO of Vinci Autoroutes which will run the completed A89. He is also president of ASFA, the motorway operators’ group. The government and operators are currently involved in a heated row over the level of road tolls, and the profits made by the operating companies. At the end January Prime Minister Manuel Valls unexpectedly froze a rise in the tolls due on 1 February. Last week, ASFA filed an appeal. Speaking on Saturday, Hollande said, ‘The solution cannot be in litigation but in the comprehensive, definitive management of highways, in the long term. A89 is France’s first full length east-west motorway stretching 505km (314 miles) between Bordeaux and Lyon via Perigueux and Clermont Ferrand. It is described as both the ‘Autoroutes of the Presidents’ because it passes through the former fiefdoms of Jacques Chirac and Valery Giscard d’Estaing – Hollande too was first elected in the Correze – and ‘The Transeuropean’ because eventually it will link Eastern Europe with the Atlantic. The irony of Hollande’s flying visit is that the stretch of A89 in question is not open to traffic yet. After final snagging, it should see the first vehicles in early April. 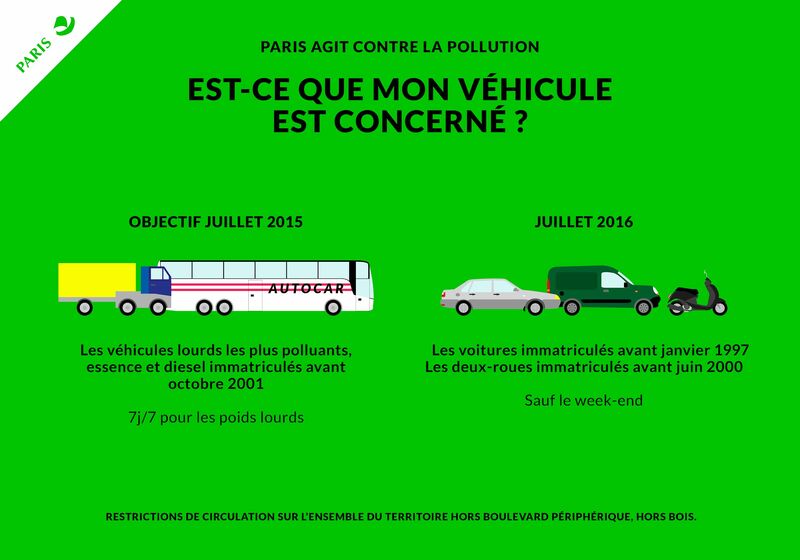 The thoroughly-previewed vehicle restrictions to prevent a re-run of the ‘Paris Pollution ‘’Crisis’’ were presented to the Conseil de Paris this morning by Mayor Anne Hidalgo. Measures now confirmed include progressive bans on vehicles based on four new emissions classes, 1-4 Star. From 1 July this year coaches and trucks first registered before October 2001 (1 Star) will be barred from entering the area inside the Boulevard Peripherqiue during the day and at the weekends. As of the same date in 2016, cars first registered before January 1997 – and bikes before June 2000 – will be excluded. At the same time, ‘ultra-low emission routes’ could be established across the city. From 2017 older vehicles will be gradually banned – and the low emission zone potentially widened – such that by 2020, only heavy vehicles registered after October 2009, cars after January 2011 and bikes after June 2015 will be allowed. There is also €1.7bn in incentives available to persuade businesses and individuals to switch to cleaner vehicles. roundup: NETHERLANDS. After announcing law changes to allow for autonomous vehicle trials at the end of January, the first ‘platoon’ truck convoy took to the A28 from the Scania plant at Zwolle this afternoon (Monday). The lead truck was able to control acceleration, braking and maintain the distance between the vehicles via automatic ‘electronic coupling’ (pretty much everything except steering). Drivers remained in each cab, able to take back control on demand. The Netherlands is hoping to champion platooning when it assumes the EU presidency in January 2016. Three other pilot schemes are due to be approved. Germany and Sweden are working on similar projects. ELECTRIC VEHICLES. €4m of EU money goes towards a project developing a network of 155 open access, interoperable fast chargers on major roads between Sweden (35), Denmark (23), the Netherlands (30) and Germany (67). Studies due to complete by December 2015. FUEL. Portugal is the latest country to hike prices following Denmark, Luxembourg and Hungary last week. Both unleaded95 and diesel rise by 5c per litre to average €1.44 and €1.26 respectively says ThePortugalNews.com. See more European fuel prices at Fuel-Prices-Europe.info. SPAIN. The A-67 Santander-Palencia road has definitely re-opened after shutting last Wednesday during the snow storm. @Charlie_Chica81 (Charlotte Jessop) drove north to south this afternoon and reports ‘lots of snow around but nothing on the roads and fab blue skies’. Meanwhile, GEORGIA’s former ‘Military Road’, along the Dariali Goreg to Russia, washed away twice last year by landslides, is closed again, this time by avalanche. It is currently open only as far as Gudauri-Kobi says Trend News Agency and unlikely to fully re-open for the next ten days.